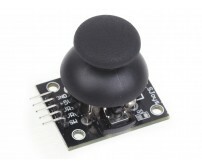 This breakout board makes it easy to mount a thumb joystick.It is an analog joystick - more accurate.. Features:Size: 91 * 51 * 32mm Fixing hole: 3mm Hole: 2000 * 1600mil (50.8 * 40.64mm) Vo.. 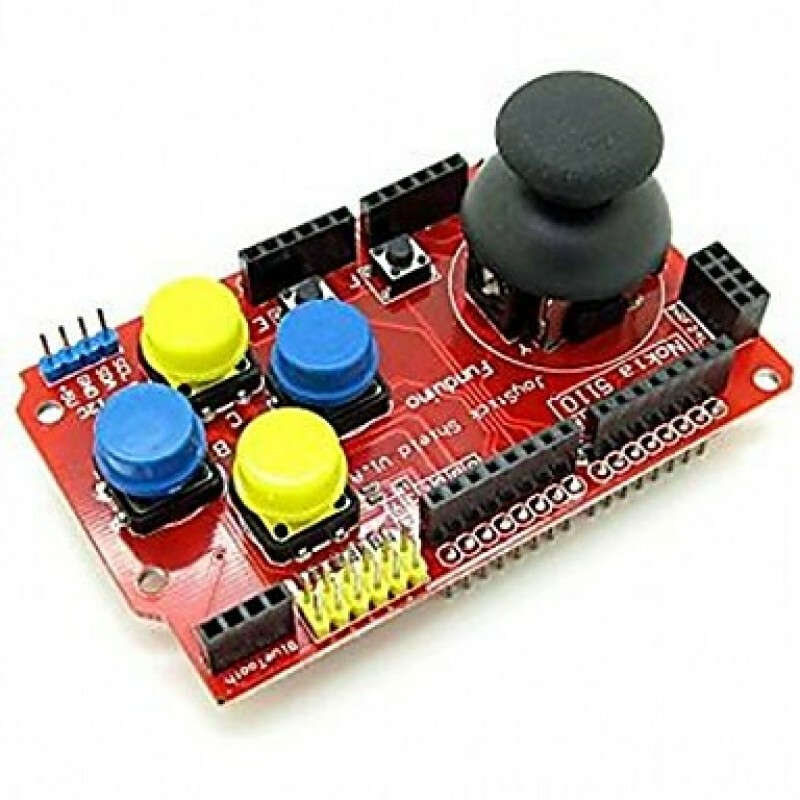 This JoyStick Shield Module Robotics Control is an Uno compatible shield that allows you to turn an Arduino Uno or compatible into a game console or robotic controller. 3.3V to 5V Gamepad Joystick Shield Module Game Rocker Button Controller Expansion Board For Arduino Simulated Keyboard Mouse Module. The shield sits on top of your Arduino and turns it into a simple controller. 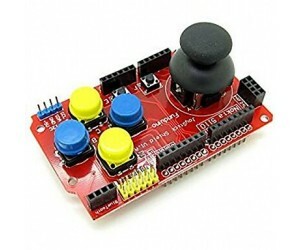 7 momentary push buttons ( 4 big buttons + 2 small buttons + joystick select button ) and a two-axis thumb joystick gives your Arduino functionality on the level of old Nintendo controller. There are a total of 6 buttons on the board (not including the one on the joystick) labeled A-F. The 4 large buttons are typically used for up/down/left/right or similar functions. The two smaller buttons are typically used for less commonly used functions such as ‘select’ or ‘start’ since they are less accessible / less likely to be pressed accidentally. All buttons have pull-up resistors and pull to ground when pressed. The RX/TX lines are brought out to a separate 4-pin female header along with 3.3V and Ground. This can be used for connecting a 4-pin 3.3V Bluetooth device or a TTL serial device. The I2C SDA and SCL lines are brought out to a separate 4-pin male header along with 5V and Ground. This is in addition to the normal A4/A5 location of these lines. This allows for easy attachment of I2C devices. 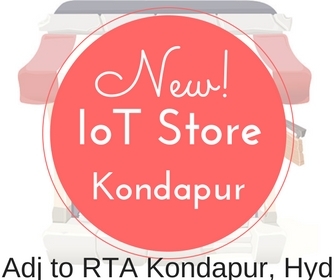 This connector allows a nRF24L01 RF transceiver module to be plugged in. This female header connector is designed to mount the Nokia 5110 LCD that was originally designed for Nokia phones and provides a 48×84 pixel matrix. This interface occupies the same D9-D13 pins as the nRF24L01, so you can’t use both at the same time. 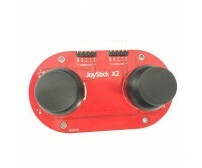 This dual row yellow male header connector provides another point of access to all the buttons, joystick pots, 3.3V, 5V and Ground. The pin-out of this connector is labeled on the board to the left of the connector. 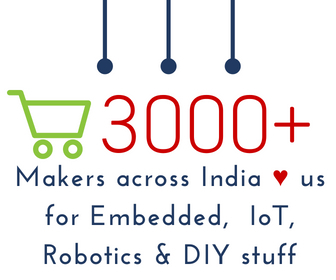 Here is an off-site link to a schematic of the assembly that you might find helpful.